I was pleased to be on-hand for the recent (Feb. 4-5) H2O World 2019 conference in beautiful San Francisco. This was my first H2o.ai conference and I was looking forward to drilling down into their popular open source solutions for data scientists including the H2O machine learning platform, Sparkling Water machine learning platform on Spark, H2O4GPU accelerated AI for GPUs, as well as the groundbreaking Driverless AI automatic machine learning (AutoML) platform. 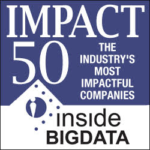 With all this leading-edge technology and resulting industry buzz, I can see why the company recently ranked #9 on insideBIGDATA’s IMPACT 50 list of the industry’s most impactful companies. In this contributed article, tech writer Rick Delgado, examines the differences between the terms: data science and data analytics, where people working in the tech field or other related industries probably hear these terms all the time, often interchangeably. Although they may sound similar, the terms are often quite different and have differing implications for business. Our friends over at DataCamp have produced the “Become a Data Scientist in 8 Steps” infographic providing a view of the eight steps that you need to to through to learn data science. Some of these eight steps will be easier for some than for others, depending on background and personal experience, among other factors. In this special guest feature, Dean Abbott of SmarterHQ discusses how data science and predictive modeling have become the holy grail for the retail industry.